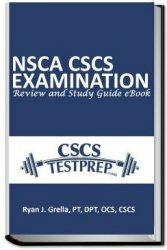 CSCStestprep.com presents the NSCA CSCS Examination Review and Study Guide eBook. Comprised of 373 pages this eBook contains a bulleted outline of all 24 chapters of the preparation text Essentials of Strength Training and Conditioning, as well as two simulated practice tests and a total of 550 multiple choice practice questions. Plus several added features. Please click here to learn more. All NSCA CSCS exam candidates want to pass the examination on their first attempt and become CSCS certified. Failure to pass any section of the exam results in additional financial costs which can be significant. 40% of candidates fail the CSCS exam. Failing the exam will cost a candidate $250 or $340, even if you are a member of the NSCA. Exam preparation material represents an investment in your certification, and minimizes your chances of incurring these additional costs in order to become CSCS certified. The cost of exam preparation material pales in comparison to the retake costs. A good study guide creates value by maximizing the utility and efficiency of your CSCS exam preparation strategy. The preparation text Essentials of Strength Training and Conditioning contains 656 pages spread across 24 chapters. Simply memorizing every word in this text is a task very few of us can complete, and frankly it’s not necessary. You should not just study for the CSCS exam; you should study the right things. Based on the CSCS exam content description, a good study guide pulls out the requisite information from the preparation text and puts it into a more manageable format. To put this another way, a study guide consolidates the relevant information and presents it in a more accessible manner. This presentation should allow for quick review, application, and memorization. The second benefit of a good study guide is practice questions. The more practice questions you can expose yourself to, the better your chance of success. Answering practice questions tests your knowledge, comprehension, and ability to recall key points. Practice questions also clearly identify deficits in your knowledge base, and suggest areas that need further review. Additionally, understanding the rationale behind correct/incorrect answers will reinforce the requisite information of the CSCS exam and aid in comprehension. A candidate should expose themselves to as many CSCS practice questions as they can find before sitting for the actual exam. In addition to the NSCA CSCS Examination Preparation and Study Guide eBook, the following guides are also in existence. CSCS Exam Content Description Booklet – this booklet provides a detailed listing of the major content areas of the CSCS exam and the specific knowledge and skills within each area that are expected of strength and conditioning specialists. A candidate can review a very detailed outline of the CSCS exam to identify weak areas that need to be remedied with focused review and preparation. CSCS Complete Online Practice Question Bundle – put out by the NSCA to help candidates become familiar with the type, scope, and difficulty of the questions on both sections of the CSCS Certification exam. The questions assist in developing a better understanding of the content and help to assess relative strengths and weaknesses. The CSCS Complete Practice Question Bundle contains questions from Exercise Science, Nutrition, Exercise Technique, Program Design, Organization & Administration, and Testing & Evaluation. CSCS Exam Prep Live Clinics – the CSCS Exam Prep Live Clinics are offered by the NSCA in three formats: 1.5-Day, 2-Day and 3-Day options with a blend of classroom lecture and hands-on training. NSCA’s Certified Strength and Conditioning Specialist (CSCS) Online Study Course – Produced by the NSCA and Human Kinetics, the course content reflects the weighting and scope of the CSCS exam and has varying levels of recall, application, and analysis learning activities for each primary objective. Featuring over 160 interactive learning activities, this online study course offers scientific knowledge and practical application and pinpoints the information required for preparing for the exam. Secrets of the CSCS Exam Study Guide – 3rd party material published by Mometrix Media LLC. Please read reviews before considering this product. Some have found it helpful others have not. CSCS Study Guide: Test Prep and Practice Questions for the Certified Strength and Conditioning Specialist Exam – 3rd party material published by Trivium Test Prep. Please read the limited reviews available for this product. CSCS Study Guide: Exam Prep & Practice Exam Questions for the NSCA Certified Strength & Conditioning Specialist Test – 3rd party material published by Test Prep Books. Please read the reviews available for this product.